In honor of our national holiday of Thanksgiving here in the United States tomorrow, I am re-posting this blog post by Sam Nadler. ​The Scripture states in Psalm 50:23, “He who offers a sacrifice of thanksgiving honors Me.” In November, we have designated one day for Thanksgiving; however, I have often encouraged families to take a month for Thanksgiving. Since the Scriptures are permeated with the theme of thanksgiving, our lives are to be permeated with thanksgiving as well. 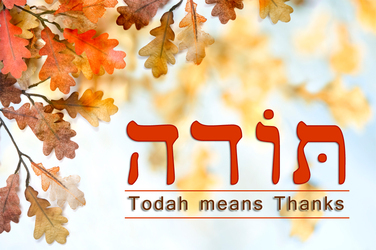 The Hebrew word for thanksgiving is todah. Todah means more than just showing appreciation, it also means praise and confession: “Now therefore, make confession (todah) to the Lord” (Ezra 10:11, see also Psalm 32:5). Here we see giving thanks as a confession of faith in the righteousness and justice of God. The thanksgiving offering found in Leviticus 7 was simply called todah, or thanks, and was actually part of the peace offerings. “If he offers it [the peace offerings] by way of thanksgiving, then along with the sacrifice of thanksgiving he shall offer unleavened cakes mixed with oil…of the sacrifice of his thanksgiving peace offerings” (Lev. 7:12,15). It is only when we have true peace with God that we can offer true thanksgiving to God. If we lack a thankful heart before God, then perhaps, we should see if we have genuine peace with God. How do we have peace with God? “Therefore, having been justified by faith, we have peace with God through our Lord Messiah Yeshua.” (Romans 5:1) It is only by faith in Messiah Yeshua that we have peace with God. This is because He is our sin offering: “He made Him who knew no sin to be sin [offering] on our behalf, so that we might become the righteousness of God in Him.” (2 Corinthians 5:21) In the Hebrew Scriptures, an offering is often referred to by simply using the descriptive word of that particular offering. In 2 Corinthians 5:21, Paul uses this same Hebrew phrase, “He made Him who knew no sin to be sin.” Yeshua did not become sinful, but became our sin offering. This is why Yeshua is also our “peace [offering].” Ephesians 2:14, “For He Himself is our peace, who made both groups into one.” Both Jew and Gentile are made into one family in God by partaking together in Messiah, our peace [offering]. Indeed, peace with God is the basis for peace with one another. The thanksgiving offering, “Now as for the flesh of the sacrifice of his thanksgiving peace offerings, it shall be eaten on the day of his offering; he shall not leave any of it over until morning.” (Leviticus 7:15) There was a sense of urgency to be thankful as a testimony to God’s faithfulness. Our giving of thanks must not be left over until morning.So often, we want to wait to see how things will turn out before we give thanks to God. But this wait and see attitude reveals a lack of faith. In the midst of problems, faith testifies that “we know that God causes all things to work together for good to those who love God, to those who are called according to His purpose.” (Romans 8:28) This is why the New Covenant teaches, “in everything give thanks; for this is God’s will for you in Messiah Yeshua.” (1 Thessalonians 5:18) Do not wait to see how things will turn out; instead, give thanks to God now! Thanksgiving is a sacrifice of faith that reflects trust in God’s sovereign will. In fact, those who had left over todah (offering) for a later time committed a sin and were not accepted before God. (see Leviticus 7:18). Thanksgiving is a result of faith that freely trusts in God. “And when you offer a sacrifice of thanksgiving to the Lord, offer it of your own free will.” (Leviticus 22:29) God does not force us to believe; we believe Him because He is trustworthy. Personal faith in God means dependence on who He is. Sometimes our circumstances are so difficult that giving thanks to God is truly a choice-a free will offering of faith. This is exactly the same faith demonstrated by the prophets: “But I will sacrifice to You with the voice of thanksgiving…Salvation is from the LORD.” (Jonah 2:9) In Hebrews 13:15 we read “Through Him [Yeshua] then, let us continually offer up a sacrifice of praise to God, that is the fruit of lips that give thanks to His Name.” Likewise, we are exhorted to offer the fruit of our lips, the sacrifice of thanksgiving to our God today, this month and forever! In light of the peace we have with God through the sacrificial gift of Messiah for our sins, how can we not give thanks to God? “Thanks be to God for His indescribable gift!” (2 Corinthians 9:15). One way we can give thanks to God is by sharing His love with people who do not have His peace. As we pray for the peace of Jerusalem, and for peace in the Middle East, let’s remember that for peace between Israeli and the Palestinians there must first be peace with God through the Prince of Peace (Isaiah 9:6). Therefore, let us give thanks to God for making us His children and one family in Messiah. “We give thanks to God always for all of you, making mention of you in our prayers; constantly bearing in mind your work of faith and labor of love and steadfastness of hope in our Lord…” (1Thessalonians 1:2,3) We are thankful to you and for you, as together we are reaching out to Jewish people around the world. There is no better time than this Thanksgiving season to express our deepest appreciation to you and say, Todah Rabah! Thank you, very much. Have a Happy Thanksgiving.